There were three sequined blazers at the Grammys last night, and that’s about as exciting as the fashion got. For an awards show that is second to the Met Gala in terms of its red carpet prowess, the biggest night in music fell short in hitting — or surpassing — the bar set by its attendees each year. Though the performances hit the mark, the pre-show, which is supposed to be just as fun as the main event, was scarce, with stunners Beyoncé and Rihanna skipping the photo op altogether. A friendly reminder: This is the Grammys we're talking about. So, what happened? For starters, the absence of those whose Grammy looks tend to stop time was felt hard. And without their presence, any and all pre-show buzz fell flat. Those who did show up played it safe — and in our opinion, to wear any old gown is a real missed opportunity. Then there's the fact that all of this could be — and very likely is — a reaction to the politicization fashion, and the question of whether, white roses and pins included, you can really fit a lifetime of the abuse of power into a single dress. With models beckoning their voices on social media and calling out photographers who've been accused of misconduct and sexual abuse, and designers adding their voices to the Time's Up and Me Too movements, the red carpet has started to look a whole lot different. And not just because Harvey Weinstein is no longer involved. 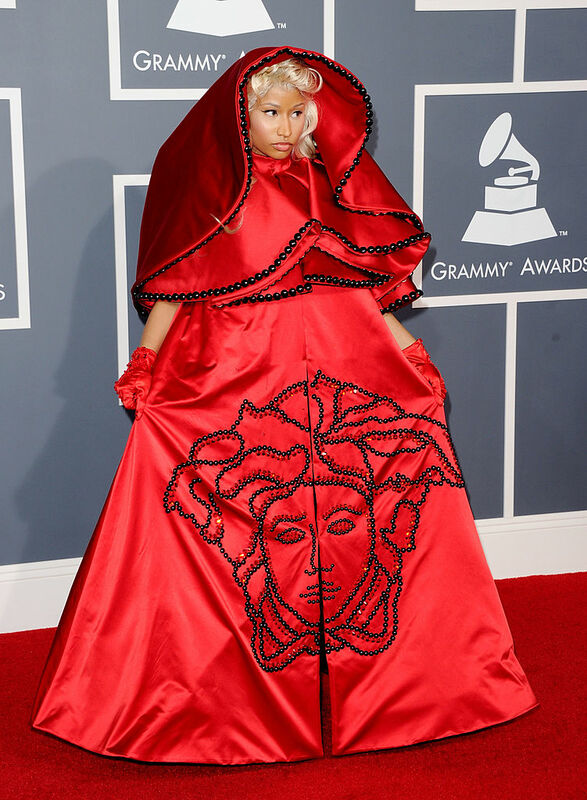 In Grammy's past, we've seen Lady Gaga show up in an egg, CeeLo Green introduce Gnarly Davidson (we're still not quite sure what to make of that one), Rihanna remind us that loofas can be fashion, too, J. Lo make fashion history with a single Versace dress, Nicki Minaj channel a leopard from head to toe, and so much more. For an awards show that changes the careers of musicians far and wide, it's prime time for an artist and their stylist to forego the fashion rules and get weird. But last night, the oddest thing to hit the red carpet was worn by someone who wasn't even nominated. The harsh reality of all of this may be something that's been in the back of our minds all along: Does anyone care about fashion anymore? In no way is the industry dead — in fact, there's promise of a new beginning just around the corner. However, the clock is ticking on whether or not social justice will turn out to be a trend, or something that actually changes things for good. And until then, we're holding onto the style moments we consider to be stand-outs, and anxiously awaiting the days David Bowie tributes and Little Red Riding hood capes re-become the norm.